From tailored itineraries and bespoke events to unique private VIP experiences, Le Connoisseur is the ultimate insider resource for planning your next trip to Paris! By definition, Le Connoisseur is a luxury travel agency. However, their unique desire to share their passion for the French art of living, admiration for French creators, and the savoir-faire of master artisans, like Ets Legeron (read on! ), make them so much more. When I came across Le Connoisseur during my research for Love Happens Volume 3’s Design Lover’s Guide to Experiential Luxury I knew instantly they were special! And thus began my experience with founder Olga Vincent and the fabulous Le Connoisseur brand. Visit Le Connoisseur online and one will find all of the traditional travel agency services offered. Composed of a team the brand describes as “a circle of insiders with a spirit of sharing and discovering, friendliness and passion,” Le Connoisseur can secure top accommodations, coordinate transportation, set up local tours and plan special events for private and corporate clients alike. But what really makes Le Connoisseur stand out is their extraordinary tailored itineraries and VIP experiences. Each is designed to allow you to become a true connoisseur of French culture, fashion, gastronomy, and luxury. The idea for Le Connoisseur was born while its creator, Olga Vincent, was working as an event organizer in France for international groups. Her fascination for French savoir–vivre led her to begin offering clients opportunities to rediscover the art of living by complementing their trips to France with creative workshops, unique encounters, and exceptional experiences. Encouraged by the enthusiastic support of her clientele, Olga decided to create Le Connoisseur. Le Connoisseur’s unique approach and Olga’s passion for sharing the rich traditions of the French art of living and master artisans and creators completely intrigues me. So, while planning my trip to Paris in January 2019 for the Maison et Objet furniture fair and the launch of Love Happens Volume 3 I reached out to Olga to set up one of her VIP experiences for some of the Lh team. As lovers of fashion, our first pick was, of course, the ‘Creation of Haute Couture details with a luxury craftsman’ experience! And although our trip coincided with Haute Couture Week in Paris Olga secured a behind the scenes tour for us at the magical Ets Legeron! It was a bitter cold Paris morning but KOKET | Love Happens founder Janet Morais, PR Director Natalia Vilaca, one of the KKLh Intern/Mentorship graduates from the Summer of 2018 program and I bundled up and headed to Galerie Vivienne where we had been instructed to meet Olga and her tour guide at 9:15 am. And thus began our exceptional Le Connoisseur experience! This was my seventh visit to Paris but up until this point I had never heard of Galerie Vivienne. Located at 5 Rue de la Banque it is one of the most iconic and beautiful covered galleries in Paris. Built in 1823 the Galerie was undergoing restoration on our visit but the neo-classical Pompeian style space was nothing short of exquisite. A registered historical monument you could almost feel the energy of the gallery’s past as we passed through it. The gallery lost some of its appeal in the mid-late 1800s when prestigious shops moved to the Madeleine and the Champs-Élysées, and Georges-Eugène Haussmann began his renovation of Paris. However, during the 1960s the gallery once again became very active. New fashion and home furnishing shops moved in. And the passageway even served as a runway for haute couture shows. In 1986 Jean Paul Gaultier and Yuki Torii opened shops in Galerie Vivienne which helped with the gallery’s resurrection. Today the gallery houses many shops selling ready-to-wear and decorative items. A fabulous vintage bookshop called Librairie F Jousseaume. As well as the chic Daroco restaurant, and the renowned Legrand Filles et Fils wine bar. It is a truly charming space and well worth visiting! After exiting Galerie Vivienne Olga and our guide led us down the street and through the beautiful Galerie Colbert. This is another beautiful Galerie which belongs to the Bibliothèque Nationale. Unlike other Parisian galleries, there are no shops in Colbert. Orientated towards culture, it is home to the Institut Nationale d’Histoire de l’Art (INHA) and the Institut National du Patrimoine (INP). However, it is open to the public to discover the magnificent glass-domed rotunda. At the entrance of the Galerie is the art nouveau style brasserie, Le Grand Colbert. Listed as a historical monument this brasserie is often used for cinema. Down an alley and up an old flight of stairs we arrived at the workshop of Ets Legeron. 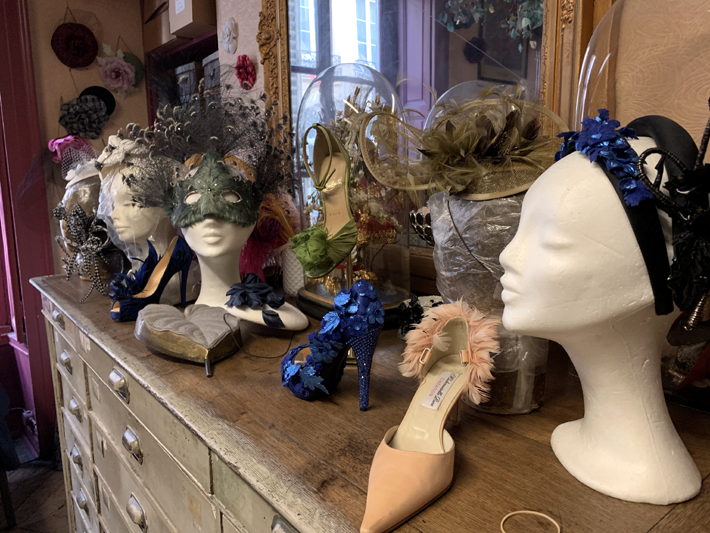 A house of reference since 1727, Maison Legeron creates stunning silk flowers and plume details and accessories for prestigious luxury clients such as Dior, Givenchy, Chanel, Louboutin and more as well as individual clients around the world. After ringing the bell we walked through a narrow hallway with vintage brown leather cases stacked to the ceiling, feathers peaking out of some. We ended in an open space with two large wood work tables and artisanal florals and plumasserie details everywhere. The space was rich with creativity and although the Maison only moved to this location in 1976 it felt as though it could have been their original workshop from the 18th century. A cheerful man in his 60s (or so it appeared ;)) greeted us as he introduced himself as Bruno Legeron. Although Bruno spoke little English Le Connoisseur translated as he animated his explanations so we could understand him. And his rosy sense of humor shown through despite the language barrier! Bruno began the tour with the Maison’s history. He explained that he is the fourth generation to run Ets Legeron. Preceded by his great-grandfather (Louis) who took over the business in 1880, his grandfather (Roger), and his mother (Claudine) with whom with he perpetuated the Maison’s expertise until he took the reigns on his own in 1993 after her passing. As Bruno spoke about the house’s custom creations for top fashion designers both in haute couture and ready to wear he tossed beautiful silk flowers, feathered accents, and countless other gorgeous high fashion accessories both complete and in sample form on the rooms large work tables. From hundreds of tiny intricate black leather flowers for a dress. To panels of flowing red feathers for the foot of another gown. The craftsmanship within each piece was astounding. Here in lies exactly why an haute couture piece can cost upwards of $100K! Now it was time to see how the magic happens! Bruno led us back down the box filled hallway. Out the door through which we entered and up the main building stairs to the next floor. Our first stop, a small room filled with brown cardboard file boxes from floor to ceiling. Each box had the name of a bird and color on it denoting the feathers inside. From old stock from birds whose feathers can no longer be used like penguin. To endless boxes of pheasant and ostrich feathers dyed in every color of the rainbow. The plumasserie possibilities within these boxes was infinite! Next, we followed Bruno through another work-room where we met two of his employees, both of whom have worked with him for over 30 years. We passed into another small room with more box filled shelves. Bruno began to pull out feather boas in a rainbow of colors. He tossed them around our necks before explaining the process of dying and creating the long feathered snakes. From the boa room we passed to “The Dressing” room. Bruno explained this was where the process of creating artificial flowers begins. The first step is stiffening the fabric so it will hold its shape in flower form. This process is done by nailing the fabric on a large wood frame and then applying a gelatin-based mixture. Once dry the fabric is pliable but stiff enough to maintain the desired shape. Metal punches for cutting petals – Legeron family legacy! We then followed Bruno back downstairs to “The Cutting” room. A wall full of hundreds of period metal punches in varying shapes and sizes (Legeron family legacy) and a large cutter press machine occupied this space. We watched as Bruno fit the selected punch in the machine. Then clamped it down on top of the fabric, cutting it on the bias to assure firmness. After cutting a pile of petal shapes Bruno led us to the dyeing room. A small room near the front of the shop with a stove top where Bruno himself hand-makes each dye. Across the back of the room’s worktable sat eleven unlabeled glass bottles filled with a variety of colorants of aniline and surgical spirit. Each petal is hand-dyed by Bruno. The first color gives the petal its overall tone. After lightly drying with a blotting paper, the surgical spirit evaporates. A second color then creates a shading effect on the petals borders. Once the desired coloration is accomplished the colored petals are left to dry overnight. Finally, it was time to realize the flowers shapes. This process is carefully done by hand using a variety of period tools. Placed on damp blotting paper, the petals become soft before molding them. A metal ball heated in a small flame, and fast cooled with wax, gives volume to the petals. Finishing touches such as pleats and frizzing are then added. Watching the women working, carefully turning the fabric petals into gorgeous flowers was truly mesmerizing! Next, the flowers are fixed or assembled. During this process, the petals are glued around a brass shaft, the pistil at the center of the flower. It dries for a few hours, stuck in a lead. Foliage is then added and the brass shaft is covered by silk thread, paper, and gutta, for the final finishing touches. And voila a flower! To complete our behind the scenes tour Bruno let us flip through his stack of portfolio photographs. Our appreciation for the endless hours which go into each of the stunning works of fashion art on these pages was now a hundred-fold! After some photos with Bruno modeling the camélia pins he gave us as takeaways, we thanked him profusely for his kindness and time and headed out the door, heads spinning in fashion fantasy land!! We loved Le Connoisseur before this visit! But wow, after this magical experience we can now say first hand if you are looking for a truly unique and inspiring experience rich with savoir-faire on your next trip to Paris then there is only one site you need to visit, www.le-connoisseur.com! Looking for more amazing companies providing luxury experiences? Check out Love Happens’ Design Lover’s Guide to Experiential Luxury! Lusa Realty – your guide to luxury real estate in Spain!